Welcome to my second report of 2019. Please make sure to check out the latest micro-plot fiction update from the Voice and Regent. This will help tie into the Fiction Competitions being run this month. I wanted to quickly cover some terms that we have been throwing around lately. Macro-plot — Refers to the top level, overarching plot updates that define the Brotherhood’s fictional storyline and direction. ** These will be released as “Chapter” updates. Micro-plot — Refers to supplemental storylines that fall under the larger Macro Plot. ** These will be released as “Prelude” or “Interlude” updates. Newspulse Aggregate — Refers to a summary of the Clan-level plotlines, and how they tie into the Maco-plot updates. Story Arc — The name of the current section of a particular storyline or plotline within an entire ongoing story. Faction — A group or organization, such as the Dark Council and The Collective. Societies — The fictional representation for the Art, Fiction, Gaming, and Academic communities in the DB. Shroud Syndicate — The Brotherhood’s ties to the underworld, piracy, black markets, and mercaney organizations through the Godless Matron. Purview of the Herald. Inqusitorius — The Brotherhood’s intelligence, spy, and assassination network. Purview of the Voice. Grand Masters Royal Guard — The ceremonial role members can earn to guard a Dark Councilor. Also maintained by an NPC cadre of unchanging guardsman. Purview of the Fist. Shadow Academy Society — The Brotherhood’s academic and acquisitions teams that support the Shadow Academy and its archives on Arx. Knowledge is power, and agents of the SAS are often sent into dangerous corners of the Unknown Regions to find artifacts and relics of power. For more information, please make sure to check the Fiction Center for all your fiction information in one convenient place. [Brotherhood Rising] Prelude is live. This kicks off the next story arc that will most likely carry us into the next Great Jedi War (TBD) Please support the official release. The Fiction Center has been updated to reflect recent changes. Going forward, I will be tracking on DB Wide fiction competitions in terms of their completion numbers: participants, time run, entries, for the most part. This will align with preventing too much clutter of prompts, and to have data to back-up my decisions to be more strict with prompt content. This will also lead to me asking members that run competitions with low entries on a recurring basis to stop/reconsider, or to maybe try spacing them out more. I’m pleased to be working with Archenskov as the new Combat Master. While the CM will not be as involved with CS Admin as previous CMs have been (Atra and myself), Arch has already helped lend assistance with development projects and other improvements to our documentation. I think there will always inevitably be some cross-pollination with Voice and CM, but I’m confident Arch and I will be able to figure it out and focus on things that improve our club's systems. Arch made a very cool update to the Skills/Powers page. 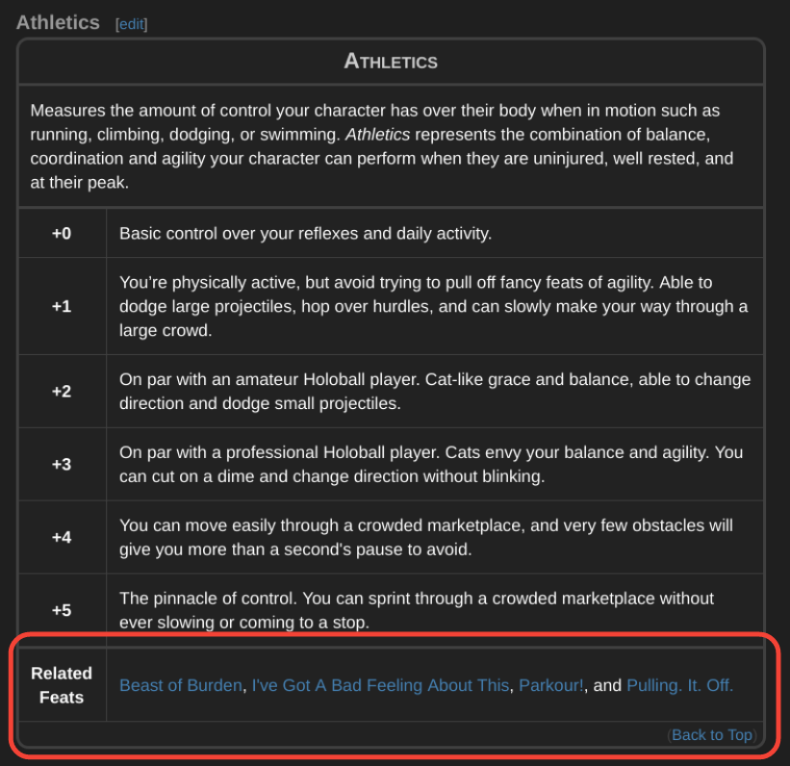 You will now see the associated Feats for a respective Skill or Force Power. Thanks to Alaris as well for helping with the Template update to house these changes. As I mentioned in my last report, each month I will highlight a fiction entry I’ve read that, while it may/may not have placed, I think was a great example of things we look for in a quality submission. From last month's Voice Workshop, we ran a Dialogue competition. There were a lot of great entries with some that did not, unfortunately, manage to place. I wanted to highlight one of these entries that was still deftly written and performed. Shadow Nighthunter wrote a very touching exchange between her two characters. It showed a lot of pain, growth, and turmoil through words alone. This is difficult to do, sometimes, without using actions of the character’s themselves, so I wanted to highlight what I felt was a good example. Going forward, I will continue to highlight and keep all Voice’s Fiction Selects here in this folder. You will be able to find this under the Fiction Resources article on the wiki as well. I will also be running a standard Multi-Objective competition that will also run for 4 weeks. It ties in to the fiction update. These competitions/approaches are based on feedback from the Winter Survey we ran. The following competition should give you an abundance of choice for your character, and should not restrict you to any one path or action while still having a chance to be involved :). If something is off or not what you were hoping for, feel free to reach out and we’ll see what we can do different for next month. Constructive feedback is always welcome. Continue to support the Brotherhood Storygroup with macro-level plot developments, while also writing micro-level updates to help with the worldbuilding aspect of Brotherhood space. This includes the fictional roles of the society, and the importance of Arx as the Brotherhood’s home planet and base of operations. I will continue to run Monthly Fiction Competitions to help set the example/bar for what I believe non-Vendetta, DB-wide competitions should be. I will continue to monitor the data of closed fiction competitions and use this information to make informed decisions for the remainder of my time as Voice. Fiction Society Leaderboard is currently under Version 1 revisions. I have the support of the Grand Master to pilot this system, and my target launch date will be for Q2 2019. We still have some logistics work to plan out, but I will be sharing my next revisions with the Dark Summit for feedback. That is all for now. My inbox is still the best way to reach me: [Log in to view e-mail addresses] but feel free to hit me up on Telegram as well. Also, I realize my Voice Report header is now over 2 years old. If anyone is bored and has some ideas, hit me up :).